THIS MORNING, friends of the fallen star stormed the Metro FM studios in remembrance of Jabulani Tsambo affectionately known as Hip Hop Pantsula or Jabba, in the world of SeTswana rap music. Where it all began. HHP, Cassper Nyovest and Towdee Mac. Constituted mainly of homeboys and some established by Jabba, they spoke highly of him and went down the memory lane on the life, struggles and most importantly the fun they had the Son of Mahikeng– although it was NOT easy to book him gigs in the province hence he left for Joburg in search of greener pastures. Tuks, in his usual demeanor said he was larger than life. “He will be remembered for having identified some of us from his hood- Mahikeng. That on its own shows what kind of a character he was. I salute you lenyora,” he said. For Cleo, he first met Jabba at Allenby Campus although they stayed at the same residential school area in Bramley- Joburg. “Out institution boasted the likes of Lira’s husband, RJ Benjamin and others, that goes to show we were at the right place. By then he was unknown as he tried to crack gigs but one thing led to another and Jabba was born until this day. Unfortunately, at the time of his passing we were working on another project for TV show, of which I was the first to be interviewed by him. His openness and humility will be missed. Rest in Peace Jabba,” he opined sadly. 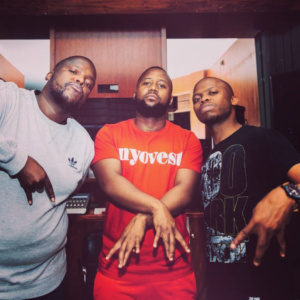 “My best memories with Jabba was when we recorded some of the Motswako songs and he’ll go on and on about what must be done, how and when. Sadly, he attempted suicides in the past and thankfully, he did not succeed. 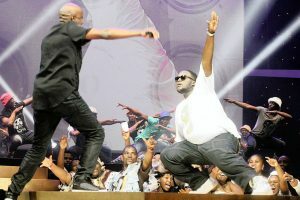 I thought he was over this depression thing and all that, how wrong I was,” pointed out Cassper. His memorial service for Joburg has been confirmed today at Newtown Factory Music, from 12 noon. Other memorials will be held in Botswana (Thursday) and Friday at Mmabatho Convention Centre in Mahikeng. HHP’s family said mourners are welcomed to attend evening prayer services in Mahikeng, Unit 5. Jabba will be laid rest on Saturday 3rd November, Mahikeng. Larger than life. HHP giving one of his top performances alongside Thebe at the SAMA. On rumours of marriage between Jabba and Lerato Sengadi, the family spokesperson Nkululeko Ncana shot down suggestions that Sengadi was a widow. According to Sowetan, HHP’s father and former Psychologist, a heated argument ensued between Robert, and Sengadi – who was reduced to tears when he refused to acknowledge her. “For the first time, Jabu’s father told Lerato and her mother to their faces: ‘Jabu is my son. I know his things. Don’t you think if he was married I would know? Jabu does not have a wife. Jabu was never married”. The Motswako fame star is survived by his parents, two sisters, his son and a nephew. Meanwhile, Barba Gaoganediwe one of the people to hand Jabba his first show in Mahikeng- and paid ‘him through a brown-envelope’ said talks with the NW Provincial Government to accord him a provincial send-off were taking place but unconfirmed at the time of publishing. He also confirmed the forthcoming Mahika-Mahikeng an annual cultural fest- will be dedicated to him. Robalang ka ntho madi a tshologe boTsambo.